Your volunteer participation is an invaluable resource, especially since it is difficult for our small (but mighty) staff of 8 to make it to every event across the state! As a grassroots, non-profit organization, we are always in need of creative, organized individuals who are interested in volunteering for the PBCC. There are many ways to get involved with the PBCC. Click on the this sign up form link to give us a little more information about yourself. Once we receive this information, we will keep you in mind for any future volunteer opportunities that match your interests and are in your area. 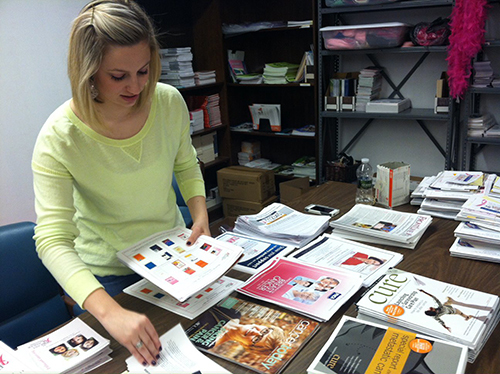 Thank you for your interest in volunteering for the PBCC! 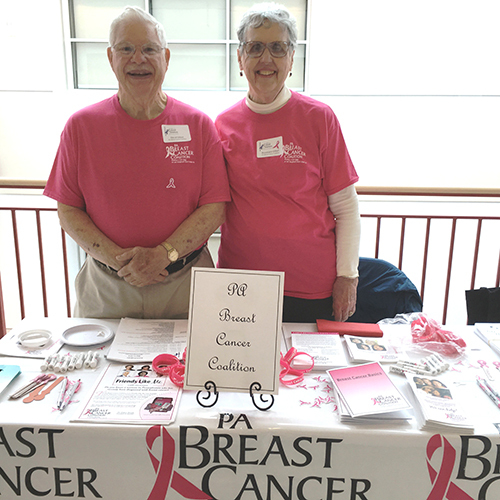 The PBCC is frequently invited to have an information table at health fairs across the state. If a staff member is not available, we draw on volunteers in that area to help. This person will encourage people to take our information and giveaways and answer any questions people might have, or direct them to our website. Unique events, organized by community members we call Grassroots Partners happen all across the state to benefit the PBCC year-round. We might need someone to register attendees at a run or walk, to work at a raffle/auction table at a dinner, or to collect event tickets at the door. There are many different jobs at so many different events; organized, motivated, and creative volunteers are needed to help at many of these events.This is our largest need in terms of volunteering, so if you are unsure where to start, consider becoming an event volunteer! Often, the PBCC is asked to send a speaker to talk about breast cancer, a personal survivor's story, or the role of the PBCC. Volunteers who are knowledgeable about the PBCC, have a personal story to share and are comfortable speaking in public are always needed for these types of events. The PBCC's traveling photo exhibit, 67 Women, 67 Counties: Facing Breast Cancer in Pennsylvania travels to approximately six communities across the state each year. In each of those communities, organized and enthusiastic committees are needed to help organize the opening reception and the events surrounding the 10-day exhibit. Individuals who are interested in donating their professional services (i.e. graphic design, legal services, photography, marketing, catering, etc.) are welcome to share their expertise with the PBCC. We are always looking for creative and new ways to spread the word about the PBCC and for help at many of our events. If you have a service you’re willing to donate, and think could be useful for the PBCC, let us know!